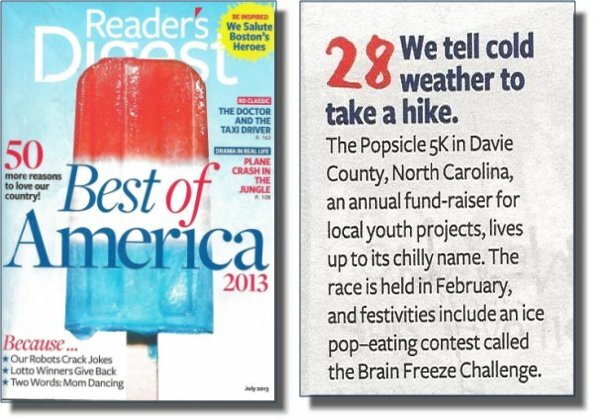 The Davie Community Foundation’s Annual 5K “Popsicle” run is the inspiration for the cover of the July 2013 Reader’s Digest. All proceeds from the Popsicle Run support youth-led projects in Davie County! Organized under the Davie Community Foundation, the SURF (Students Understanding Real Futures) Board is a youth grant making organization for high school aged youth in Davie County. Each year SURF hosts a fundraiser to raise money to grant out in the spring. The proceeds from the Popsicle Run empower young people by supporting their projects through grants from SURF. One of the youth projects funded by the Popsicle 5K for 2012 was the purchase of video editing equipment for the Davie County Young Filmmakers. Enjoy the video below covering the 2013 5K Popsicle Run. The video was produced by the Davie County Young Filmmakers. Does your school club have a service project idea, but lack money to get it started? Are you involved in a church youth group that could use a grant to fund an outreach project? You may be eligible for funding from the S.U.R.F. Board Youth Grantmakers. The SURF Board Youth Grantmakers, organized under the Davie Community Foundation, are a group of 18 high school students who wish to better the lives of Davie County young people by raising money and awarding grants to support youth-led projects. • Address general issues that impact the youth of Davie County. • Involve at least two youth in planning & carrying out the project. Download the grant application or pick up an application from the Davie Community Foundation at 194 Wilkesboro Street in Mocksville.